Charlevoix, Quebec, is about an hour east of Quebec City. Four hundred million years ago, an asteroid that was estimated to be 4.5 kilometers (2 miles and 1,401 yards) in diameter hit that region. The enormous impact created a crater measuring 55 kilometers (33 miles and 975 yards) with a mountain in the center. Over time, Mother Nature has continued to sculpt the landscape. Wind, rain, snow, glaciers, and changes in temperature, as well as other natural elements, have made an impact on what locals call Charlevoix Astroblem. This crater is one of the ten largest in the world, and UNESCO has declared the region a World Biosphere Reserve. At the Discovery Center for Charlevoix, visitors can learn about this phenomenon and also take panoramic photos. As a lover of natural environments, I was content to explore the fertile valleys of this pristine region that was contoured by an asteroid falling out of the sky. 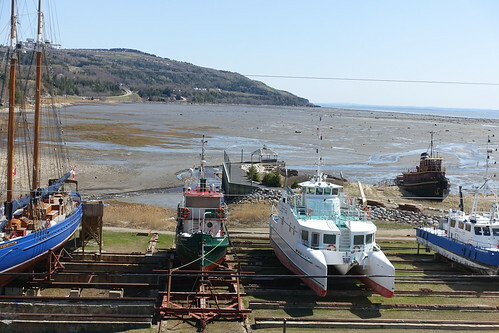 I admired the coastal towns along the St. Lawrence River between Baie-Saint-Paul and La Malbaie. 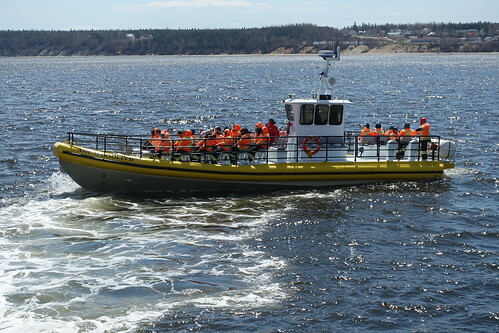 One morning, I braced myself during a tumultuous Croisiere AML zodiac ride that embarked from Quai de Baie-Sainte-Catherine and entered the Saguenay—St. Lawrence Marine Park, one of the first conservation marine parks in Canada. While all of the zodiac passengers were eager to take photos of whales, seals, and birds, most had their heads buried in their laps as brisk, piercing winds howled and bucket loads of icy water cascaded into our boat. Due to the extreme conditions, I was only able to capture a handful of tiny beluga whales in the distance, a couple of baby seals sunning on rocks in a calmer area, and a coastal waterfall. As I breathed crisp Canadian air and trekked through the countryside, I learned how Charlevoix’s history was tied to the river and its tributaries, as well as the adjacent countryside. This museum is located on the banks of the St. Lawrence River at the site of a former Saint-Joseph-de-la-Rive shipyard and local sawmill. The onsite exhibits allow visitors to go back to a time when schooner travel was the norm and people relied on the river for most of their transportation needs. The railroad didn’t appear until 1918, and roadways followed a few years later. Thus, the ability to navigate the river was essential for the coastal villages that relied on the schooners, small boats, and canoes when the river wasn’t frozen. 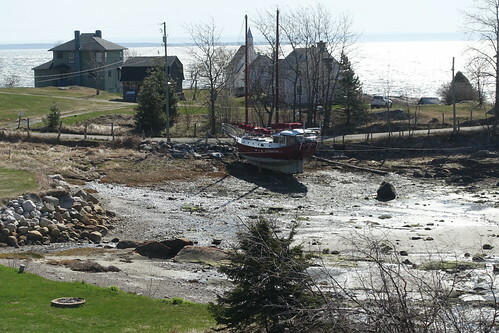 Between 1860 and 1930, dozens of schooners were built in Les Eboulements-en-Bas, the former name for the local village. As a result, most of the villagers had jobs associated with the maritime industry. The museum’s buildings showcase models, timelines, and artifacts with descriptive diagrams in French and English that retell the shipyard’s story. When I visited, only a sampling of the new exhibits were operational, since the official opening was still a few weeks away. Beached schooners added another dimension to the museum. They sit adjacent to the buildings along the shoreline. We didn’t have time to board any of these wooden crafts. I was informed that at least one would be open for viewing at a later date. In Charlevoix, shipbuilding was the norm, with 375 schooners having been constructed along the shoreline. Despite a preponderance of maritime activity, a designated shipyard didn’t appear until the 1940s, when 20 local villagers invested in the project. The Mont Saint-Marie schooner took twenty men approximately two years to build from lumber harvested from the oak and maple trees in Charlevoix’s nearby mountains and Douglas fir, which came from Quebec City. The schooner was launched in 1952. Twenty-six years later, schooners along the St. Lawrence had become a footnote in history. After participating in a tour of the open buildings, I walked through a newly created child-friendly 20-acre park that will keep preschool and school aged children actively engaged. 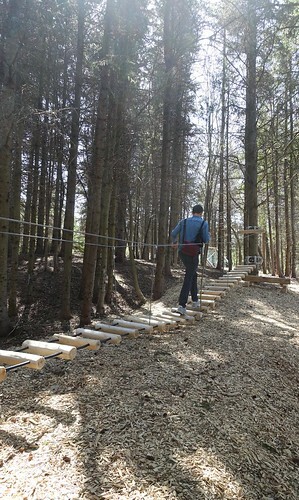 My small group of mature travel writers, who are young at heart, took turns trying out the sturdy outdoor equipment that included an array of slides and footbridges, as well as climbing and crawling apparatuses set in a forested area. The labyrinth with a treasure chest in the middle was still under construction. A lack of time prevented a hike on the 4-kilometer nature trail near the coastline. Unfortunately, I was unable to view the new women and children’s exhibit, Women and Children First. After I returned home, I was sent information about the exhibit. 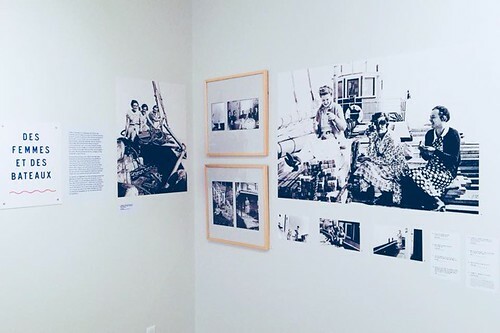 Images introduce visitors to life in a seafaring village and illustrate the roles that women and children played while their husbands and fathers were at sea or cutting down trees in the forests. The exhibit showcases a few women who chose to be members of schooner crews and, in a couple of instances, these women inherited their husbands’ schooner businesses when they passed away. Interestingly, a significant percentage of women contributed funds to maintain the shipyard’s heritage. 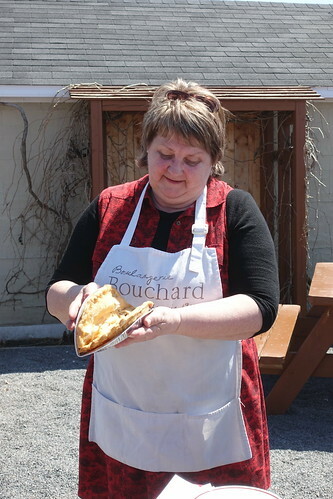 This bakery stands out because it is the only one on Isle-aux-Coudres…and it is where thousands of people flock to taste a unique pie recipe that has been handed down from generation to generation. History came alive when the owner of the shop, Noelle-Ange Harvey, introduced herself and started to talk about her family. Our small group sat at a wooden picnic table on a terrace outside the restaurant as Noelle-Ange retold, and demonstrated, the history behind Pate croche— crooked pies that are half-moon shaped. Long before the ferry brought people to the island, the locals used canoes. Excessive waves in the icy Canadian waters caused the meat pies to become crushed. The local women created crooked pies to overcome this problem. They improvised by folding the pastry into a half moon shape that was easier to transport and eat. Noelle-Ange also shared her version of the origin of the Pets de Soeurs. 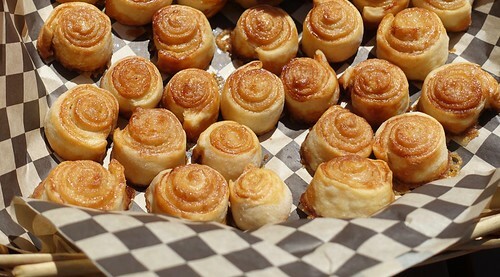 Nun farts are a pinwheel styled pastry filled with cinnamon, brown sugar, and oodles of butter. Since several different stories are shared online, it’s hard to determine the exact origin of this less than appealing name. Noelle-Ange’s bakery’s shelves are filled with a wide assortment of baked goods and lunchtime items. The sweet aroma inside the shop encourages visitors to purchase a delicious homemade item. This shop will intrigue anyone who loves fruit. From apple, pear, plum, Saskatoon berry, and cherry orchards, the company creates a variety of beverages, butters, syrups, jellies, and jams. One hundred years ago, three Pedneault brothers started the ball rolling by planting 300 apple trees. Over time, more land was purchased, as it was determined that the orchards were located in a microclimate with cooler summers and milder winters that were conducive to growing fruit trees. Until 1970, church and state regulations limited the creation of cider. A couple of decades later, the Pedneault family introduced a new product called Ice Cider, and also made cooked fruit products. By the late 1990s, the Pedneault’s cider business had expanded considerably. 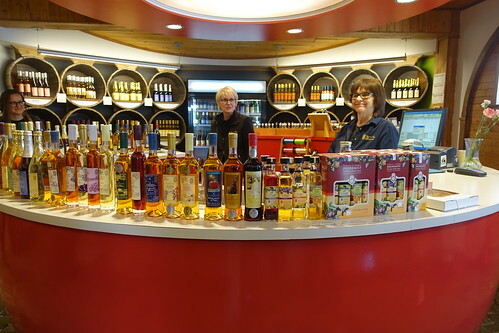 Visitors to the shop can sample a selection of their products, including the potent alcoholic ciders, and learn about the family’s history. The working mills date back to the early 19th century, when the islanders were searching for a way to be self-sufficient. They were unable to produce enough grain to last throughout the winter, so they had to make treacherous trips to the coast. Alexis Tremblay built the first watermill in 1826. When the watermill could not match the needs of the community, two streams were diverted to supplement the insufficient water level. Even though wind is an unpredictable commodity, Alexis’s son Thomas built a windmill in 1836 to increase the ground wheat production. The velocity and the direction of the wind can easily wreck havoc with the grinding process. Thomas and subsequent millers needed to react appropriately to the changing wind conditions. A chart highlighted the nine millers from three families that operated the mills at this site. Tragedy came to the fifth miller, who was strangled when his scarf became entangled in the machinery. Surprisingly, the eighth miller was the widow of the seventh miller. She continued to operate the mill until she married the ninth miller. A series of events led to the mills shutting down in 1957. In 1981, the Ministere des Affaires Culturelles restored the mills and opened the site to the public. 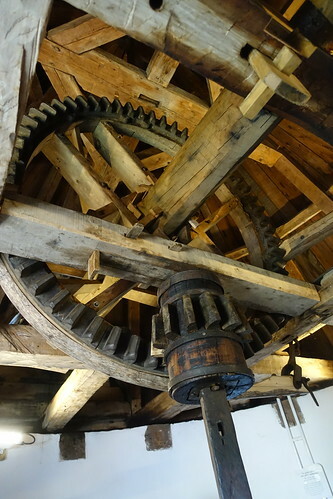 Visitors will be impressed by the complexity of the operation exhibited by the number of gears, wheels, cogs, and miscellaneous parts that need to work in harmony in order for the grain to be milled efficiently. 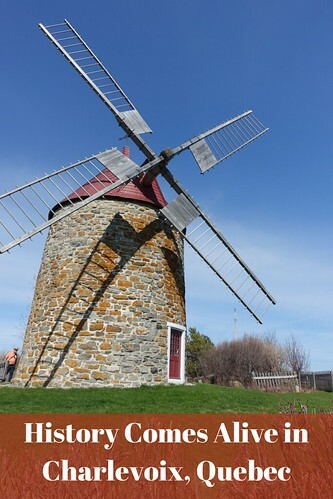 Today, this attraction has the distinction of being one of the few places in the world where both a watermill and windmill are still operating. Mill ground flour can be purchased onsite. Visitors to the Women and Children First exhibit at the Maritime Museum will see how affluent summer tourists from Quebec City, Montreal, and the United States affected the local economy. Like today’s adventure seekers, these tourists flocked to Charlevoix to embrace the area’s natural beauty and to participate in outdoor activities, like fishing and boating. Back then, most were cruise ship passengers sailing up the St. Lawrence River. Today’s visitors tend to arrive by car, train, or plane. 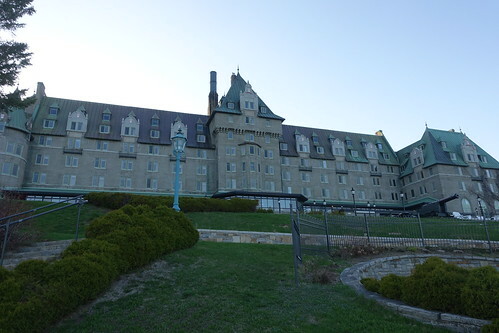 Le Manoir Richelieu is now part of the Fairmont brand and attracts another generation of affluent and sophisticated guests. In the lower level of the hotel, guests can learn tidbits of information about the hotel’s past by looking at display cases filled with photos and memorabilia. Another option is to stay at the Le Germain Hotel & Spa. Before a devastating fire destroyed the property, the site had the largest wooden farm building in the region. 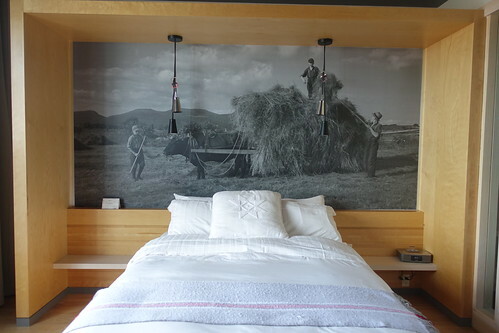 The hotel’s modern architectural style is offset by a unique farm motif that is visible throughout the public and private spaces. The Family accommodation with a queen and two bunk beds or The Junior Suite with a queen bed and a retractable bed are designed specifically for the traveling family. Families, couples, and singles will all relish the well-lit, spacious rooms that are stocked with an abundance of modern technology. The farm and country accents complement the onsite garden, the pastures with farm animals, and the restaurants that serve seasonal entrees. In the summer, the chefs use honey cultivated from 15 onsite beehives and harvest fruits, vegetables, and herbs from the property’s garden. 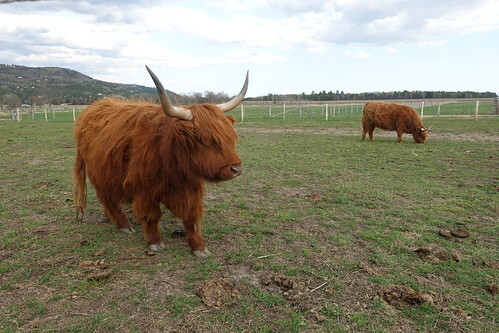 Young and old will be attracted to the farm animals that roam freely in pastures. Urban parents can easily provide ad hoc lessons that relate to the history of agriculture. Charlevoix has a multidimensional history that is showcased in numerous places throughout the region. This sampling of places is an introduction to Charlevoix’s history as well as day-to-day life. Sandy Bornstein visited Charlevoix during a preconference media trip arranged by DQMPR in conjunction with the Travel Classics International 2018 Travel Writers Conference in Montreal. Sandy Bornstein, the History Comes Alive Through Travel Editor for Wandering Educators, has visited more than 40 countries and lived as an international teacher in Bangalore, India. Sandy’s award-winning book, May This Be the Best Year of Your Life, is a resource for people contemplating an expat lifestyle and living outside their comfort zone. Sandy writes about Jewish culture and history, historical sites, family, intergenerational, and active midlife adventures highlighting land and water experiences. Her stories appear in print media and online sites.